When it comes to home improvement work, insulating and ventilating your attic isn’t one of the more exciting projects. Attics aren’t really ever seen by homeowners, and you probably don’t use yours on a regular basis. So it’s easy to lose sight of of your attic’s condition—but it’s also crucial that you don’t neglect your attic. It’s important that you have both insulation and ventilation in your attic. It should be able to keep warmth in while also allowing cool air to flow through it, even if that seems counter-intuitive at first. This is very important for your roofing during the winter months, when colder air needs to be kept in to prevent ice dams from forming and causing serious problems for your roofing. Sealing air leaks and insulating will also help to keep condensation from forming and causing moisture damage. When your attic is properly ventilated, the extra hot air is pushed out of the attic, where it naturally rises to as it gets hotter. 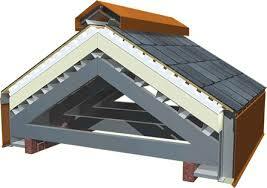 The insulation works to block the transfer of heat from sunlight. This keeps your home more energy efficient throughout the hotter parts of the year. It also helps to protect your roof’s shingles and help them shed moisture. Use rafter and soffit vents to promote adequate ventilation. If it gets very hot, installing attic fans to cool the attic down can be a great way to save on energy costs. Get the most of your home’s attic insulation by installing rafter vents before covering the entire floor of the attic with the insulation out to the eaves. Make sure to never cover soffit vents with insulation.